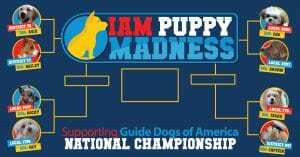 This March, IAM is hosting our first ever Puppy March Madness fundraiser to benefit our favorite charity, Guide Dogs of America. With a $1 donation, our members can cast a vote for the cutest Machinist pup! Dogs will move to the next round by getting the most votes in this March Madness-style bracket competition. 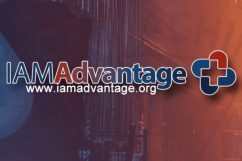 Vote now to help select the cutest dog in the IAM family. Your donation will help support the thousands of families with guide dogs around the country. Guide Dogs of America provides guide dogs free of charge to blind and visually-impaired men and women across the U.S. and Canada. We couldn’t imagine our IAM family without our four-legged friends, and for the blind or visually-impaired men and women receiving dogs through GDA, their four-legged friends can change their lives. The post Vote Now to Pick the Cutest IAM Dog appeared first on IAMAW.